Sick of driving a slow automatic car with crappy brakes we decided to do some upgrades. 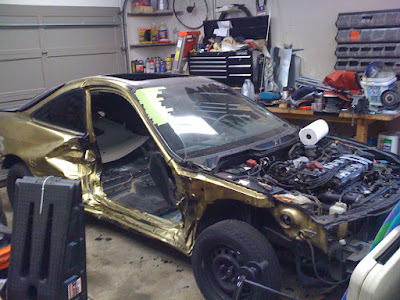 Integras are essentially souped up Civics, so we started looking for an Integra from which we could swap parts. From poking around on Honda sites, it looked like the Integra parts would bolt up pretty easily. This site had some of the better info on getting better brakes in an older Civic. Fortunately we came across a '95 for only $600. The car wasn't much more than a bent shell. The previous owner had been T-boned, trashing the body. He had already stripped and sold everything that wasn't making the car go. What was left, however, was exactly what we needed: and engine, manual transmission, and the brakes. So now I have two trashed cars in my driveway. My neighbors must be so happy.